Welcome to My Underwear Drawer! I begin with an apology for the delay in getting this issue out. Digging out from the blizzard and a couple of family issues required immediate attention. But what are we quilters, if not good at piecing together the many patches of our lives? It's time to get busy with some quilting! If you're like me, after Christmas my quilt workspace is a mess. Projects ambitiously started for a Christmas completion sit forlorn and undone. Fabric purchases await washing, pressing and folding. 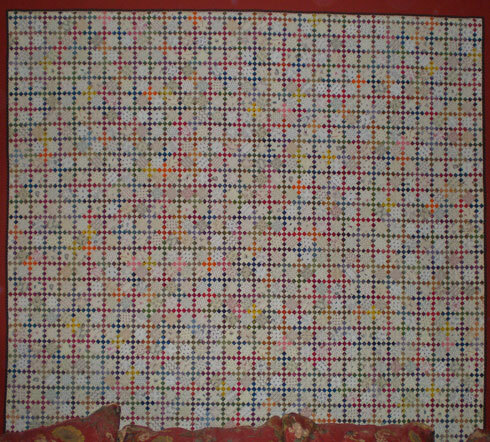 Patterns and magazines are piled to be read and sorted. This year my resolution is to get my stash and work area in order. What about you? ...is YOUR QUILT FABRIC STASH! It's been personally selected just for YOU by the person who knows the most about YOU! But do you ever find yourself starting the next "BIG QUILT PROJECT" and instead of shopping your own fabrics, you go to the quilt store...because it's easier? "Welcome to my Underwear Drawer!" That was the original name of this enlightening blog post on the StashManicure blog. In it Teresa, from Fabric Therapy, shows AND describes how she tames her fabric stash. Click here to see the full (renamed) article "Can You Be TOO Organized?". There are a lot of good pictures of her organization techniques. Sort fabrics by color AND value. Keep fabric in see through or translucent boxes. Use a temporary labeling system. Your stash will change over time and this keeps you flexible. Use storage boxes that are easy for you to use/lift. If you're using boxes, storage the fabric so that you can see it all when you open the box. Use a system that works for you! Practice your system until it becomes second nature. It's easiest to keep your workspace organized when everything has is own permanent space. With an AccuQuilt Go! that is! I'd sat on the fence about the AccuQuilt Go! fabric cutting system for awhile but at the last minute scribbled it on my Christmas list. Lo! And behold! It appeared! The Go! retails for $349.00 which is pricey (in my book) for cutting quilt fabric. As of this writing, Amazon.com's current sale price is $206.00 (it also includes a 'Value Die' that cuts a 4-1/2" square, a 2-1/2" square and and half square 2" finished triangles, a fabric pick to clean loose threads from the die and a 10"x10" cutting mat). So why'd I buy it? I don't like to rotary cut...could hand sew on binding all day long...but don't think I've ever rotary cut a complete quilt in one day. I also like to work on quilts with lots of pieces like the "Birthday Quilt" and "My Oh My Gosh Quilt". Mountains of 1" strips needed to be cut for both of those quilts. So the first die I bought for it is the 1" strip cutting die (#55052) and the 10"x24" cutting mat (#55113) to go with it. I can now cut many 1" strips through 6 layers of fabric in one pass. That's a lot of time rescued from a task I really dislike. What really pushed me from a 'looker' to a 'buyer' was the following YouTube video by Ebony Love of quiltpossible.com. Watch this 6-1/2 minute video to see an AccuQuilt Studio (the larger, more expensive version of the Go!) in action. Using this quilting tool to help convert my messy menagerie of fabric scraps into usable strips sold me on the whole thing. Don't you just love how Ebony just folds up the freshly cut strips for storage! Look for more information on AccuQuilt fabric cutting systems on the website later this month. One of the best things about writing this newsletter is to be able to share neat things! And I've found something that I just can't wait to share with you. Erin Russek, from the One Piece At a Time Blog, has begun her new 2011 appliqued Block of the Month (BOM) called "My Tweets". 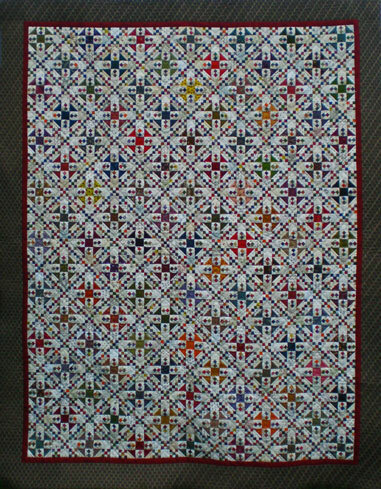 It is in follow-up to her 2010 BOM called 'Florabunda'...also a spectacular quilt. The twelve monthly blocks will be offered as free downloads. Check her blog to find when each block design will be available. 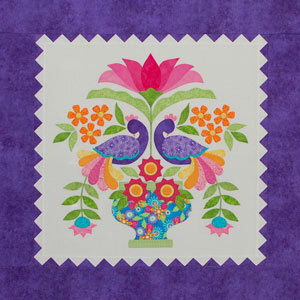 NOTE: To complete the quilt with twelve blocks surrounding this medallion block, you must purchase this center medallion block pattern from her Esty shop. You can do so by using the pink "Visit My Shop" button at the top of the lefthand side of her blog to get to her store. Erin has indicated on her blog that she will also offer a way to put the blocks together for a twin size quilt without the purchased center block. All the other blocks will be offered as free downloads throughout the year. Click here for your free download of Block 1. Find it by scrolling down to her entry dated 1/14/11. Downloading is a click of a button away, just remember this free block pattern is in four separate downloads. You'll find background and sashing fabric requirements in Erin's entry dated 1/12/11. 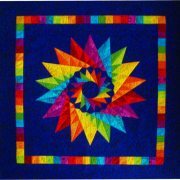 For more ideas, see what other quilters are doing with her pattern. Check out Erin's My Tweets Flickr Group. You're certain to find some inspiration. I am particularly fond of the block by the gal using inks to enhance her fabrics. For those of you who love applique quilts, but aren't fond of hand applique, don't despair! I suggest you take a look at the invisible machine applique technique shown on the Generations Quilt Patterns website. If you choose this method and need help preparing a particular shape, ask your question on the page Machine Applique Questions...Answered. I'll prepare the shape and provide photos of the steps in my response. I do hope you enjoy this project! This newsletter is for YOU. Your input is so very important to us! If you have comments, ideas or feedback, we'd love to hear from you. 'Suggestions for topics to cover or general questions? We're all ears. Please Contact Us and tell us what you think! If you received our newsletter from a friend, you can easily sign up for your own by visiting the Generations Quilt Patterns Newsletter Sign-up Page. Well, that's it for this month's STASH Talk. I hope this issue found you well-rested, warm and working on a quilt! Until our next issue in March, thanks for reading and Happy Quilting!